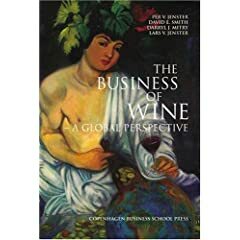 The Business of Wine: A Global Perspective by Per V. Jenster, David E. Smith, Darryl J. Mitry and Lars V. Jenster. Copenhagen Business School Press, 2008. The Business of Wine is an ambitious little book. It aims to provide a streamlined introduction to the global wine busness, which is a lot to try to cover in just 198 pages. The result is necessarily a bit uneven but still quite useful. This is a useful introduction, especially good for students, but not a book to give to your Master of Wine colleagues. If you are an expert on the French wine industry or wine market, for example, you will probably bemoan the lack of depth found here. But if you know little or nothing about the topic, you will probably think this a good place to start. A survey of the winegrowing sectors of the major world wine nations takes up about a quarter of the pages and this is probably the most uneven part of the book. This is understandable, I think, because there is just so much information that could be included and so little space to hold it, so the choice of what to say and what to omit is very arbitrary. The result is necessarily a bit superficial, but still useful. Consult your Oxford Companion to Wine for fuller detail. Chapter 8 on wine company strategies is also noteworthy — this time for its effective use of brief but informative case studies to show how wine companies in different market segments have developed particular strategies. Company profiles include Gallo, LVMH, Foster’s, Freixenet and Chateau Margaux. Some of the information is already a bit dated, which is understandable because the wine business is so dynamic, but the analytical points are still useful. Note: Thanks to Francine Graf for bringing this book to my attention.